Over a number of years, MAKAR has developed its own closed-panel system that sets the ecological standard for off-site manufactured natural SIP (n-SIP) systems. The roots of ‘breathing fabric’ panels can be traced back more than thirty years to the Findhorn Foundation and their early ‘eco-homes’. The principles of utilising a number of layers of hydroscopic materials – materials which allow the safe passage of moisture in a controlled manner without degradation while avoiding interstitial condensation have been well established in the north of Scotland since the early 1980’s. Whatever the construction type or the materials used; masonry, steel or timber, unmanaged moisture will kill a building. 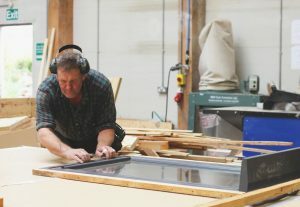 The industry standard of utilising moisture barriers in timber panel housing normally uses a plastic vapour barrier layer built into the panel. To perform adequately this vapour control layer requires high levels of skill and care in order to keep the barrier continuous. In our oxygen rich environment, plastic degrades over a few decades so in reality these moisture barriers have a limited life. When used to perform as part of the air-tightness requirement in the fabric, a discontinuous vapour barrier will contribute to the performance gap – the measured difference between the modelled energy performance of a home and its actual energy performance. In developing its fabric-first approach, MAKAR has used the same breathing fabric principles and fused them with progressive off-site methods. The external fabric of all MAKAR homes; floor, wall and roof panels are manufactured in a similar manner. Incorporating un-chemically treated locally grown timber, ridged wood-fibre insulation together with loose cellulose insulation materials, the unique design and manufacture process of the n-SIP utilises natural materials throughout. 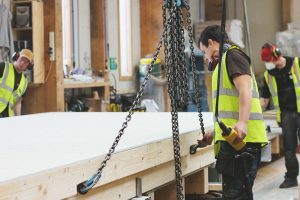 The use of two forms of natural wood based insulation allows the company to produce panels that safely respond to changing moisture conditions whilst reducing thermal bridging to a minimum. In contrast to the industry standard SIP, these closed panels are air-tight, healthy and have a high level of thermal capacity, effectively storing energy within the house fabric. Using local renewable materials with low embodied energy results in large amounts of sequestrated (stored) carbon. An in-depth embodied carbon study undertaken by the University of East Anglia in 2014 revealed that the MAKAR off-site system utilising n-SIP panels is truly Carbon Negative – in the delivery of a MAKAR home more carbon is taken out of the biosphere than is used during the processes employed to produce it. All panel components are mechanically fixed without the use of glues allowing the panel to be easily and safely taken apart, or deconstructed. The potential re-use of non-toxic timber or cellulose layers allows for all the materials employed to be available for future re-use; a key aspect of principles of the Circular Economy. The loose fibre insulation element incorporated into the company’s closed panel is pumped in under pressure and sealed between the interior and exterior surfaces of the cassette whilst in factory conditions. The density of the fibre is carefully calibrated to avoid slumping during future transport. All panel edges are sealed with air-tightness tape ensuring that there is no air movement within the panel itself and ensuring that the insulation material is not exposed to moisture during assembly on site. The panel can also be pre-plumbed and wired before arriving on site to further accelerate the construction process. Panels are formed with external finishes, complete with windows, doors and roof components including roof-lights and solar collectors. The closed panel system is a key building block for the Company’s integrated design and delivery approach, reducing on-site construction time to watertight stage for a three-bed house to just three days. This reduces costs associated with preliminaries together with traditional on-going construction wet-trade processes such as brick laying which are slower to perform, release more carbon and may be significantly delayed by poor weather conditions. The floor, wall and roof panels are relatively large compared with more traditional ‘open-panels’ which are often man-handled on-site. n-SIPs are generally up to 3.6 wide by 6.0, 7.2 or 8.4 long, limiting the number of these panels required to form a new home. This in turn improves the manufacture and assembly efficiency and reduces the number of joints between panels, a potential air-tightness weakness. Recent work-in-progress advances in n-SIP development include the substitution of Scottish loose wood-fibre for the recycled cellulose fibre insulation material. 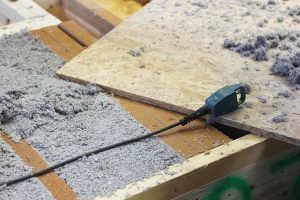 This advance is aimed at significantly reducing the material-miles employed, and embodied energy as a result of our current practice of importing cellulose insulation from Germany or the Czech Republic. We are also currently at an advanced stage in defining an n-SIP specification for Passivhaus Certification. The Passivhaus quality standard has become a benchmark in ultra low energy in-use housing; however, the numbers of houses utilising this standard are low in the UK, with only perhaps 500 homes delivered in total over the last ten years. 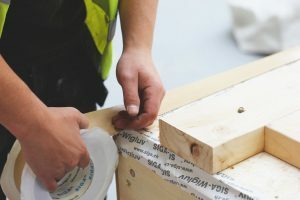 The mainstreaming of the Passivhaus standard by way of an off-site method, could rapidly improve the uptake of a Low-Carbon approach to future home delivery.